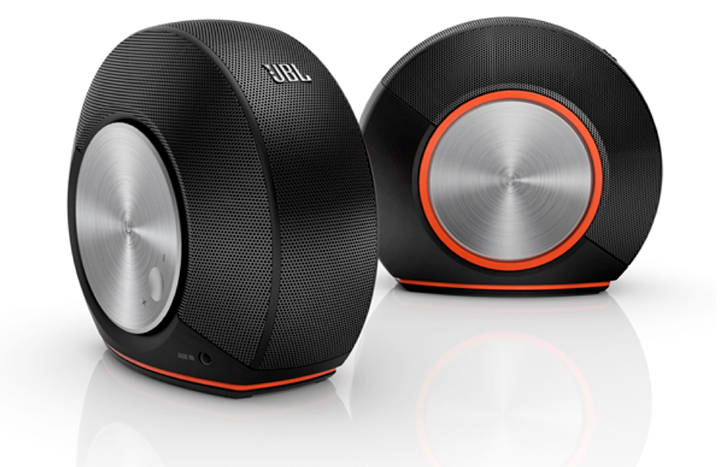 JBL has debuted two new radically designed speakers today at IFA 2013 in Berlin. JBL's $129 Spark is a swanky wireless, cone-shaped indoor speaker with a bright colorful translucent enclosure that features two high-performance 40mm audio drivers for room-filling stereo sound output as well as a "tuned" bass port which JBL suggests results in a "crisp, clean, high-end, sound with a warm, rich bass response in a versatile shape that you can take anywhere." 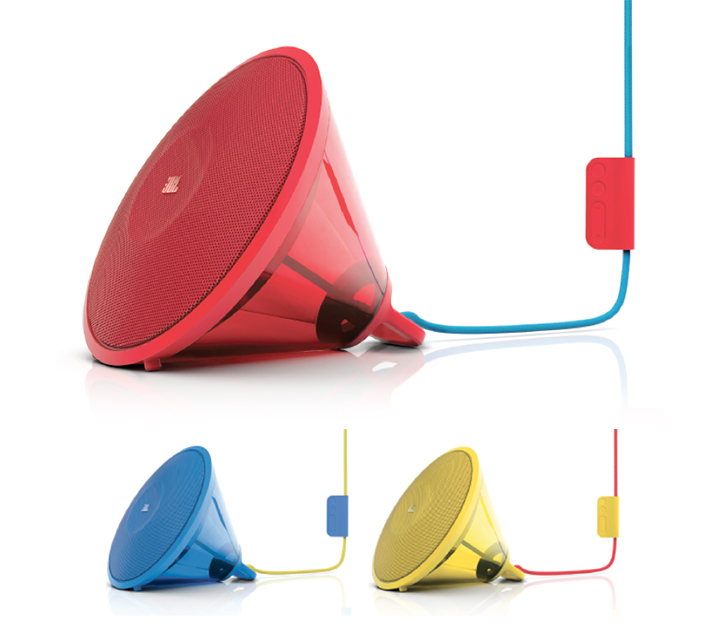 With a compact size and a 7" diameter cone, the Spark's megaphone-inspired unique design also allows it to be hanged on a wall or placed on a table as you wirelessly stream your music using a Bluetooth connection. JBL's Spark includes a stainless steel hanging hook and a fabric cord with inline controls - we didn't expect to find that on a wireless speaker that's for sure. No cool lighting effects unfortunately. On the other hand, JBL's affordably priced Pebbles is an actual desktop computer stereo speaker system consisting of two left and right speakers rather than a single portable speaker you can travel with. The Pebbles speaker system is USB powered and connected featuring a sharp looking rounded design with an upright standing form factor. They feature dual 50mm audio drivers that deliver "best-in-class natural sound, with clarity in the high end and deep, sonorous bass", a brushed radial metal-accented rotating volume control dial on the side, built-in cable management and an auxiliary 3.5mm audio input for a broader device connectivity. JBL's Pebbles speaker system will be available in multiple color choices for $59. No official release date has been announced for either speakers, but we're sure they'll hit retail shelves later this month.